This adorable "I love my cats" ribbon is a great addition to any proud kitty parent's car. Show your pride and passion for your animals anywhere with this adorable ribbon. 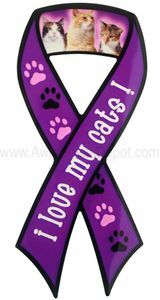 Ribbon is purple with pictures of cats on the loop and paw prints as well as wording. Make sure to see our full selection of Animal Lover products for more great ideas and gifts.